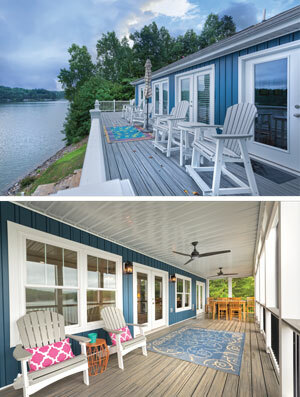 The Fungarolis’ Smith Mountain Lake home looks nothing like it did in 2002 when the family from Raleigh, North Carolina, first purchased it. What was once a tight two-story home with latent flaws has emerged into a chic and functional getaway destination for BJ, Caroline, their kids and extended family. Yet there is still more work being done on the Long Island Estates property. Caroline’s parents bought the house with the intent of making it a retirement destination. Tucked off of Virginia 122 near LakeWatch Plantation, the route to the house offers an inviting and peaceful drive through wooded land before reaching the narrow peninsula where it rests. Beautiful water views and inescapable serenity are hallmarks of this section of the lake. Sadly, the unexpected passing of Caroline’s father just two years after buying the house changed everything. Without her husband, Caroline’s mother would never make the move to the lake full-time. The house was still a spot for the family to get together, but things weren’t quite right. BJ and Caroline talked to her mom about buying the home, with the plan of renovating it into something special. “We said to her, ‘Let us buy the house, we’ll renovate it, and we’ll keep it in the family for as long as we can,’” BJ says. Caroline’s parents purchased the home out of foreclosure, so they knew there were going to be some problems. 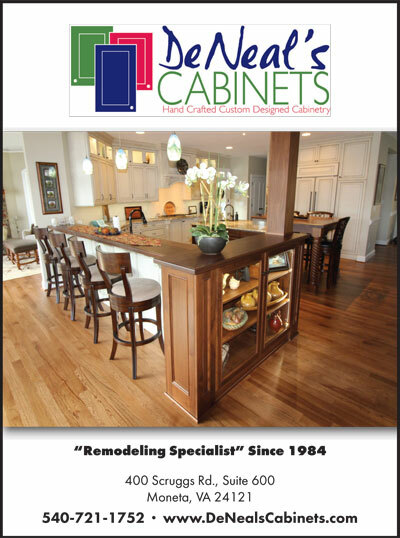 But it wasn’t until a decade and a half later, when Caroline and BJ began doing those renovations, that they grasped the magnitude of the issues. BJ owns a company in the demolition industry, so he had a particularly unique perspective on what kind of hurdles the renovations would entail. 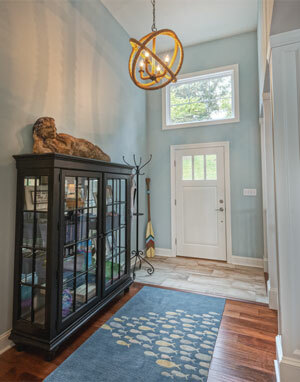 The Fungarolis hired F&S Building Innovations Inc., in Roanoke, to do the work, and the couple collaborated closely with Alicia Smith, the interior designer at F&S. “It was really nice for Alicia and F&S to be so candid right up front,” BJ says about the planning process. It was a situation in which they could easily end up spending more money on the renovations than the house itself was worth. There was a lot of work ahead. The house had a small kitchen, a narrow garage and cramped family room. Footsteps—like those of scampering children upstairs— thundered through the basement. Conversations, especially with BJ’s deep voice, would make their way throughout the house. The couple even considered, then dismissed, adding another story onto the building. And then there was the rot to deal with. Stains dotted the basement ceiling, and, likely due to flashing issues, water damage was found in the exterior wall in the basement and by the front door. There was significant rot behind a faux stone façade on the lower level, and damage was even found on the hardwood floors inside many of the doorways. There were also structural cracks around many doors. The most stunning change the Fungarolis made was eliminating the garage and expanding the kitchen. 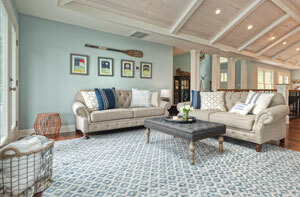 Anchored by a large, granite-topped island, the room has become one of the home’s most inviting gathering spots. BJ knew that structural areas are easy places for builders to take shortcuts—a concern that was realized when the landscaper (Raleigh-based Taproot Land Management) found significant rotting around the deck. Though the deck felt solid, the footers on the poles were dug only into the dirt, with no concrete padding or supports, and they were nearly rotted the whole way through. This is Smith Mountain Lake, after all, so having a full view of the lake is a priority for any renovation work. 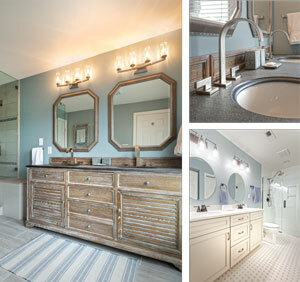 BJ and Caroline also wanted more bathroom space, and a second master bedroom suite for Caroline’s mom to visit. The downstairs needed room for the kids to play, including the opportunity to have little campouts on the porch. Ultimately, the Fungarolis wanted durability in their appliances, surfaces and decorations—a sense of comfort without kids or guests feeling like they have to walk around on eggshells. The most stunning change that the Fungarolis made was eliminating the garage and using that space to expand the kitchen. 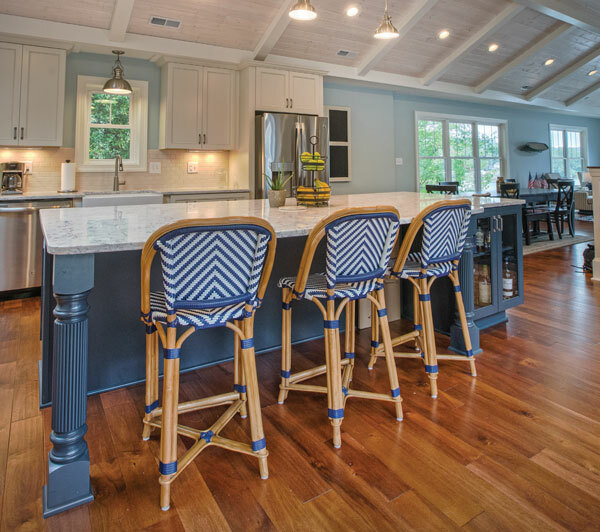 Anchored by a large, granite-topped island, the kitchen has become one of the home’s most inviting gathering spots. A bank of windows and a skylight set into the raised, whitewashed ceiling complement the light-colored cabinetry and shiny, stainless-steel appliances—a blend of amenities that give the room an airy feel set amid a natural glow. It’s not hard to imagine morning coffee in this room, with several friends and family members. It’s why the room is one of Caroline’s favorites—there is space for everyone to move, and the couple even had two refrigerators installed (one for food, one for drinks) to help with the flow. This area spills into the living room, where the Fungarolis extended the raised ceiling to the far end of the house, expanding the view of the water. It creates a sense of openness that the original layout lacked. “What’s amazing is that this isn’t that big of a house,” BJ says. “The footprint, initially, was about 2,400 square feet without the garage, or about 2,800 with it. From the outside, it looks tiny. 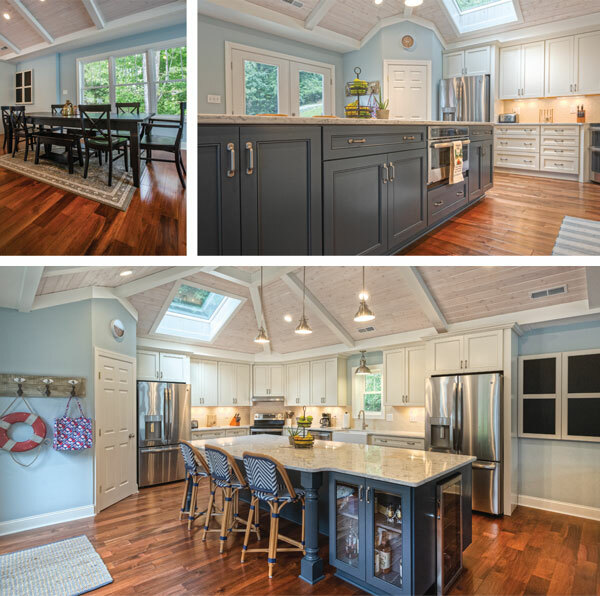 Then people come inside and say, ‘Wow, this is a lot bigger than it looks!’” Two sets of French doors lead to the deck, and a skylight that mirrors the one in the kitchen adds symmetry and ambience. 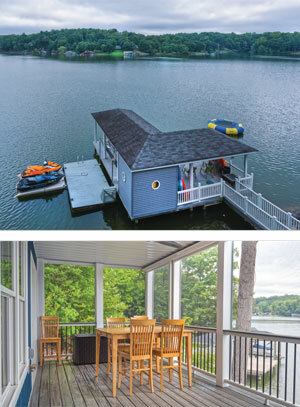 The deck’s railing was replaced with a clear railing, which helps to complete the broad view of lake. 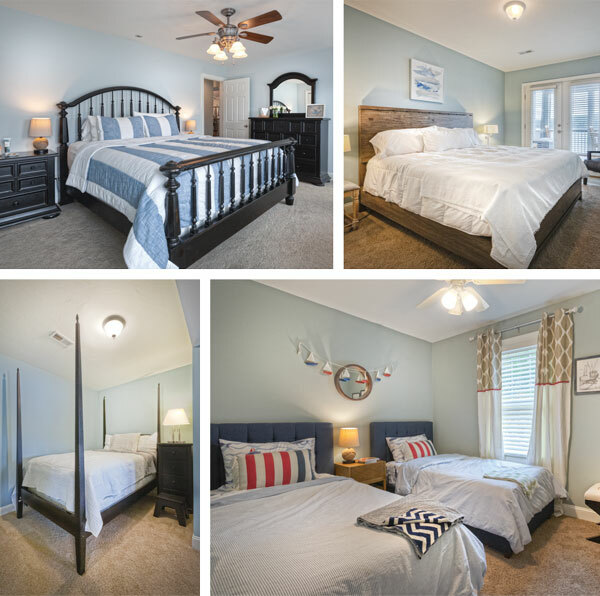 The family’s primary sleeping space is on the main floor, where the master bedroom, as well as the kids’ bedrooms (they have a 16-year-old and twin 4-year-olds), are located. Soundproofing was added to the walls for privacy, and most of the closets were removed to allow for expanding bathrooms and other features (some of that space has been—or will be—supplemented with shelving and wardrobes). “We knew coming in that we weren’t converting this house for the resale but rather for our family,” BJ said. In all, the home has six bedrooms, and four full bathrooms. The highlight is the master bathroom, with dual vanities and a shower boasting tiled walls, a glass entryway and a showerhead mounted directly overhead. There are also easily accessible handheld showerheads here and in a downstairs bathroom to help expedite cleaning the kiddos or their dog after time spent outside. 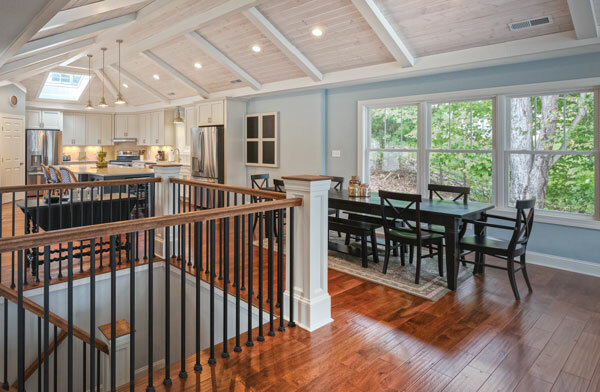 One renovated area that the couple are particularly proud of is the lower level of the deck, which was improved by a ceiling, screening, and fans. It gives the family a place to relax when the bugs are bad or when wet weather decides to sweep in. “It’s a great place to come have drinks, just another area for people to come and get a bit of privacy,” Caroline says. She says that this was the “smartest” addition they did in terms of extending the home’s livable space. The central space in the basement features a large entertainment area and plenty of room for kids to play. Board games and other toys line the shelves and are tucked into closets. Mimicking the upper level, the basement originally had several double doors that led to the outside, but the couple converted all except one of them into windows, helping to funnel traffic and allow parents to monitor where their kids are. The existing bedroom has been updated—with a pocket door and the addition of a sleeping nook for kids who need to stay close to their parents at night—as well as the bathrooms and the laundry room in that area. While so much has changed inside, there have also been many changes outside. Though Caroline initially drew inspiration from a trip to Nantucket and leaned toward a cottage feel on the home’s exterior, the end result is a mix of craftsman and cottage style. Even the front door—one of the few original elements remaining—has gotten a facelift with a colorful paint job. Around the side of the house, the landscaper replaced the risers down to the dock with smaller, 8-inch versions. There was also the addition of a prominent stone fire pit just below the driveway. “My favorite time to go out there is around five, when it’s still bright out but the water is beginning to calm down,” Caroline said of sitting around the fire. Prior to renovations, the couple spent about four weekends a year at the lake. Now that the work is largely completed (there are a handful of landscaping projects that are still on tap), they’ve been here closer to two to three weekends a month—and for a lot longer at a stretch. Last July, they had 14 people visit during the first week. The following weekend almost repeated the feat. “It was amazing that people were sitting around the table, kids playing in their area, but we were all one family,” BJ says. The sense of connection to Smith Mountain Lake that has developed for BJ was never something he imagined—he didn’t previously boat or fish, and never considered himself a “lake person.” All it took was an invitation from his then-girlfriend Caroline to visit the region, and he was hooked. “I got here, and within two hours of hanging out at the dock with her family, I fell in love with this place,” BJ says.